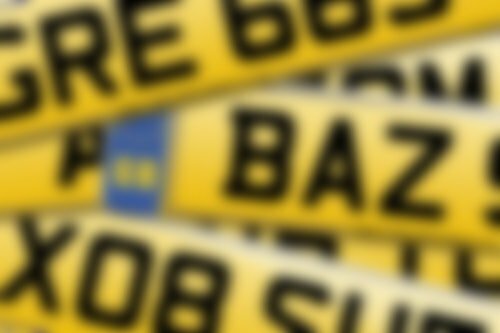 There are several established formats for number plates. Here we explain each of them and what information they communicate about the vehicle they're on. When registrations were introduced in 1903, and before the suffix format came into effect in 1963, they had no discernable year identifying letters or digits on them. With a registration like this it's impossible to tell (without insider knowledge) how old the vehicle displaying it is. Prefix registrations are so called because their initial (prefix) letter identifies the age of a vehicle, suffix registrations because their trailing (suffix) letter identifies the age of the vehicle and the New style reg can identify a vehicle age from the two digit number they contain. All of these styles of registration follow the rule that they cannot be assigned to vehicles that were manufactured before their date of issue. But because dateless registrations have no way to identify their age (hence their name), these registrations can be assigned and displayed on vehicles of any age. Because these format registrations date back to pre-1963, they're considered the cream of the crop in the number plate world. They're often very difficult to come by, simply because vehicles they were originally on will have long since been scrapped. They do, however, come with a history attached to them and you can be sure that the reg you're buying will be one of only a small number of similar reg still on the roads. Dateless reg come in various configurations, either with 1, 2, 3 or 4 digits followed by 1, 2 or 3 letters, or the reverse with 1, 2 or 3 letters followed by 1, 2, 3 or 4 digits. The letters in the registration would originally have been able to identify the area of the country in which the registration was issued. We presently have 65,617 dateless registrations on our database. Suffix registrations are those which follow the format of three letters, a number which can be 1, 2 or 3 digits in length, and finally a single year identifying letter. The first three characters would originally have been able to identify the area of the country in which the registration was issued. In our example FVL indicates that this registration would have been released in Lincoln. The number is simply a way of uniquely identifying one registration from the possible 999 alternatives with the same prefix and suffix combinations that could be out there. The final letter (or suffix hence the name of this style of registration), would originally have been used to determine the age of the vehicle it was being displayed on. You can see a full table of release years below, but for our example, F would suggest 1967. Have you spotted that the I, O, Q, U and Z are not included amongst the suffix letters? The 'I' and 'Z' were reserved for Northern Ireland registrations. 'Q' is always reserved to register vehicles whose date of manufacture is unknown - a 'Q' mark is non-transferable. 'O' and 'U' are not used as they are too easily confused with 'Q' and 'V'. As these registrations have an age identifier (the suffix), you can only assign them to vehicles of the same age as the registration or younger. As with all registrations that carry a year identifier you can make your vehicle look as old as you want, but not one day newer. So, for example, the above registration - FVL 144M - could be assigned to any vehicle first manufactured after 01/08/1973, but you'd be unable to put it on a vehicle that was manufactured before that date as you would be giving the impression that the vehicle was more modern than it is. We presently have 70,713 suffix registrations on our database. Prefix registrations are those which follow the format of a single year identifying letter, then a number (which can be 1, 2 or 3 digits in length), and then finally three more letters. The prefix character is to describe the age of the vehicle as explained in the table of years of release below. In this example K would be from 1992. The last three characters would originally have been able to identify the area of the country in which the registration was issued. In the above example the WTB indicates that this registration would have been released in Liverpool. Have you spotted that the I, O, Q, U and Z are not included amongst the prefix letters? The 'I' and 'Z' were reserved for Northern Ireland registrations. 'Q' is always reserved to register vehicles whose date of manufacture is unknown - a 'Q' mark is non-transferable. 'O' and 'U' are not used as they are too easily confused with 'Q' and 'V'. As these registrations have an age identifier (the prefix), you can only assign them to vehicles of the same age as the registration or younger. As with all registrations that carry a year identifier you can make your vehicle look as old as you want, but not one day newer. So, for example, the above registration - K50 WTB - could be assigned to any vehicle first manufactured after 01/08/1992, but you'd be unable to put it on a vehicle that was manufactured before that date as you would be giving the impression that the vehicle was newer than it is. We presently have 7,844,564 unique prefix registrations on our database which you can search through. These registrations are those which you will currently find on newly registered vehicles. They follow the format of a two letter prefix, followed by a two digit year identifier and finally three more letters. The New Style reg became the current standard for vehicles from the second half of 2001 - and replaced the exhausted prefix format. For the first time in UK mainland registrations the letter Z was allowed as a character in the last three letters - but not in the prefix. The two prefix letters of this registration would originally have been used to identify the area of the country in which the registration was issued. In this example, SK indicates a Scottish release, most likely from the Edinburgh DVLA Vehicle Registration Office. The two digit number in the registration would originally have been used to to determine the age of the vehicle it was being displayed on - as shown in the below table. In our example, 64 means a year of release for this number plate of 2014 (specifically the second half). The final three letters are random characters. As these registrations have an age identifier (the two digits), you can only assign them to vehicles of the same age as the registration or younger. As with all registrations that carry a year identifier you can make your vehicle look as old as you want, but not one day newer. We presently have 46,009,244 of these style registrations on our database for you to search.